LONG BEACH — Peter Tong of Long Beach Yacht Club and his Santa Cruz 70 OEX started last in the inverted-start pursuit race Jan. 6 and passed 25 other boats to win the 2013 Two Gates Pursuit Race, hosted by Long Beach Yacht Club. 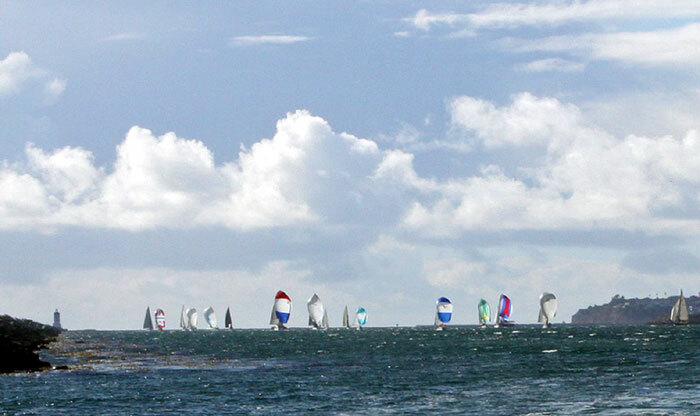 In a pursuit race, boats of various sizes and speeds race each other using the equalizer of their PHRF handicap rating — but in a reverse start. The slowest boat starts first and the fastest boat starts last. Each boat is assigned a specific starting time, and the idea is that all should arrive at the finish at about the same time. Tong routinely races OEX in ocean races over distances of hundreds of miles, but the much shorter 13.2-nautical-mile course that weaves in and out of Long Beach and Los Angeles harbors didn’t give him the luxury of sitting back and waiting for an opportunity to pass. In the solid breeze of 10-17 knots, he picked off the fleet boat by boat, taking the lead with about 2 miles to the finish. After finishing second last year, first place is a nice way to start off the new year. Second place went to co-skippers Will Durant and Jeff Shew of Long Beach YC, on their Santa Cruz 52 Relentless. Rounding out the trio of Long Beach YC top finishers was Ray Godwin and his Farr 40 Temptress. Godwin won this race in 2012, and he regularly competes in Farr 40 One-Design and PHRF races. The race was held on a cool January day in the mid to high 50s, and the forecast of a 60 percent chance of rain didn’t materialize. It gave way to scattered clouds and sun, making this a beautiful Southern California winter day to start the 2013 racing season. Long Beach YC reinvented its long-standing Two Gates Invitational race in 2012 and turned it into a pursuit race. But the club didn’t change the course — which starts in Long Beach Harbor, takes the boats up to Los Angeles Harbor and then heads back in to Long Beach for the finish. The race gets its name from the fact that the race boats weave in and out of Long Beach’s Queen’s Gate harbor entrance and Los Angeles’ Angel’s Gate harbor entrance. Final results are: 1st: Peter Tong, Long Beach YC, Santa Cruz 70, OEX; 2nd: Will Durant/Jeff Shew, Long Beach YC, Santa Cruz 52, Relentless; 3rd: Ray Godwin, Long Beach YC, Farr 40, Temptress; 4th: Ron Simonson, Cabrillo Beach YC, Jeanneau SO44, Sleeper; 5th: David Fell, Seal Beach YC, Farr 49, Javelin.